Reproducibility is one of the hardest stages in a research project. Here are tips for writing successful papers in any field, re-blogged from the Scientific B-Sides Blog. Methods vs Insights is back. Today with a discussion of general research practice. Most projects in my lab take years from start to finish. So it is important for me to manage the expectations my students and postdocs may have. 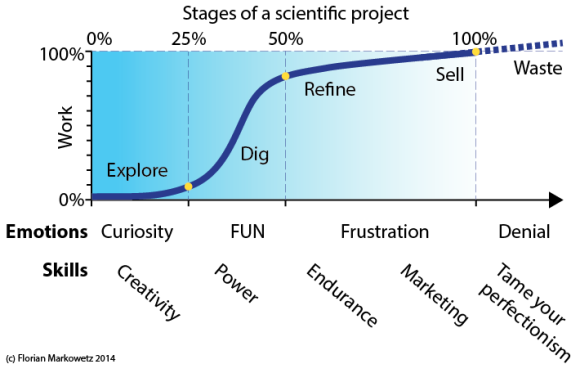 Here is a plot I have developed to discuss the different stages of a scientific project with them and to prepare them for what’s ahead.